I’ve pointed out that there are plenty of “scare stories” about the National Health Service that are completely true. And completely scary. Just click here, here, here, here, here, here, here, here, here, here, here, here, here, here, here, here, or here if you want examples. To be fair, there surely are horror stories from every health care system. Humans are imperfect, after all. But I suspect shoddy care is more common when healthcare providers get a salary from the government. Under such an arrangement, patients are a burden rather than a source of revenue. Set that aside, however, because there’s a feature of the U.K.’s single-payer system that is reprehensible and it has nothing to do with the quality (or lack thereof) of care. The UK-based Daily Mail reports on this very disturbing case. The parents of terminally-ill baby Charlie Gard are ‘utterly distraught’ and facing fresh heartbreak after losing their final appeal in the European Court of Human Rights. Chris Gard, 32, and Connie Yates, 31, wanted to take their 10-month-old son – who suffers from a rare genetic condition and has brain damage – to the US to undergo a therapy trial. 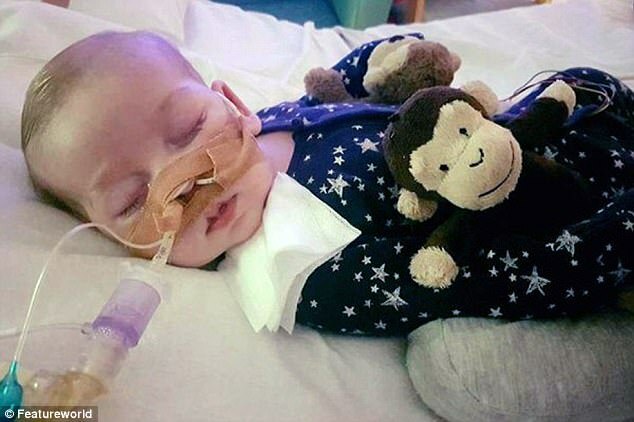 …the couple, from Bedfont, west London, raised almost £1.4million so they could take their son to America but a series of courts ruled in favour of the British doctors. …the ECHR rejected a last-ditch plea and their ‘final’ decision means the baby’s life support machine will be switched off. …It comes after a High Court judge in April ruled against a trip to America and in favour of Great Ormond Street doctors. …Specialists in the US have offered a therapy called nucleoside. …barrister Richard Gordon QC, who leads Charlie’s parents’ legal team, …said parents should be free to make decisions about their children’s treatment unless any proposal poses a risk of significant harm. …Charlie’s parents have raised nearly £1.4million to pay for therapy in America. Ian Tuttle of National Review explains what’s really at stake in this case. Any day now, they’ll kill Charlie Gard. …Charlie’s parents have raised enough money from private donations to fund the experimental treatment, but the court decision prohibits his removal to the U.S. …successive courts in the United Kingdom and in Europe simultaneously found that Connie Yates and Chris Gard had devoted themselves unhesitatingly to their son’s welfare for ten months, and also that Yates and Gard could not be trusted to act in their son’s best interests. …pertinent to this case, under what circumstances should the tightest bonds of affection — those between parent and child — be subordinated to the judgment of the state? The part that astounds me (in a very bad way) is that the courts won’t allow the parents to bring their son to the United States. Their not asking or expecting the taxpayers to pick up the cost. They’ve raised money to cover the experimental treatment. Yet the government won’t let them try to save their son’s life. Even if the doctors are right and the experimental treatment fails, why shouldn’t the parents be allowed to do the medical equivalent of throwing a Hail Mary at the end of a football game? I can’t even imagine what the parents must be thinking. If some government official said I had to allow one of my kids to die and that I didn’t have the right to try anything and everything to avert that outcome, I don’t even want to think of what I might do. “The NHS will ban patients from surgery indefinitely unless they lose weight or quit smoking, under controversial plans drawn up in Hertfordshire. I agree that, especially the central tenet of the verdict “death with dignity” (dignity according to whom? ), reeks of a condescending mentality that asserts: “Individuals are subjects who ought to do what the majority prefers, and dissenters are not looked upon favorably”. Unless libertarians see no role whatsoever for child protection state authority, judgment on this case is a little hasty. I cannot medically evaluate the impact of the proposed US trial in this child. But it may not be a Hail Mary pass. Trials in the US, and the rest of the world, do not necessarily benefit trial subjects. As a matter of fact it is typical for trial subjects to sign that they understand this fact. Ethical review boards can approve a trial that just benefits science (and thus potentially future patients) but not the subjects themselves. E.g. a new medical imaging mode that exposes trial patients to some radiation without a plan to use such images for the trial subject’s benefit. So long as these facts are explained to trial subjects the trial can be approved. In this context it is possible that the proposed US trial for this child was just that. A trial that would sacrifice the (doomed anyway) child so that science may learn something, perhaps for future children. It is also possible that the trial might have prolonged this child’s suffering. Again, I don’t know the medical facts about the child’s disease, his condition, the proposed trial, but all I described is quite likely. In that context, the British government may just be trying to prevent emotional parents from subjecting their child to more suffering. How I personally feel about that is a long story, and I find it difficult to form a definitive opinion. That does not mean I’m in favor of government healthcare. Government intrusion into healthcare is truly a one way valve. Virtually no country has returned from government healthcare. Every step towards more government control of healthcare should be regarded as irreversible. Case in point, republicans might, (and I do say “might”) roll back one of the ten steps democrats made towards government healthcare in the past eight years. Ten steps down, one up. The trajectory is clear. Of interest is also how a woman’s cervix is essentially the gate where one passes from conservative to liberal control. While you’re inside the uterus, liberals could not care less about your life. Your mother can just kill you for all they care. Conservatives are more concerned. But once out of the uterus, conservatives loosen their grip and liberals take over. No passive smoking, limits on sugar, forced vaccination, make sure the child’s brain is inoculated with common core education etc. This isn’t healthcare. It’s not even deathcare. Perhaps it is time that they do a kidnapping. I guess, however, that is fraught with issues, as the child probably needs massive life support to transport him to the US. Perhaps the second alternative is to get a kind doctor to declare him dead prematurely…surely they couldn’t have an issue with the parents transporting their “dead” child to the US for his “funeral” arrangements? It is so frightening. When I first read the story, I thought as I always do, there is more to this than we are being told. But no!!!. Those less than human judges and bureaucrats are just going to let the child die. The European Court of Human Rights has given the British government right to keep the child away from its parents, and let it die. Under the European welfare state, human rights are protected so long as they don’t cost government any money. Cold and inhumane. This why we can never forget the moral case for free-market capitalism. Freedom is not only effective at providing prosperity, it also allows for greater human dignity. This Charlie case shows us the danger of allowing government to become ever-more enmeshed in our lives. As I said in this post about the nanny-state (https://caseforcapitalism.wordpress.com/2017/05/11/freedom-1-nanny-state-0/), effectiveness is good, but there is more to life than effectiveness. After all, Josef Mengele may have been effective.